from Old French frontelet, diminutive of frontel (Modern French fronteau) “forehead, front of a helmet, hairband,” from Late Latin frontale “an ornament for the forehead,” from frons (see front (n.)). The paragraph also contains commands concerning mezuzot (11:18). A mezuzah (lit. “doorpost”) is a little case, containing parchment which is inscribed with the verses Deut. 6:4-9 and 11:13-21, attached to the doorpost at the entrance of rooms in a Jewish home. Etymology is uncertain. See http://www.jewishvirtuallibrary.org/jsource/judaica/ejud_0002_0014_0_13806.html . The themes in the above-mentioned paragraph echo throughout the portion: If you listen and follow all the commandments things will go well (Canaanite kingdoms, fertility, etc.). But you also need to remind yourself that you are not totally responsible for the good outcomes. There is no “self-made man.” Humility and moderation are called for; you will eat and be satisfied, neither starving nor pigging out. To buttress his assurances, Moses reviews a little more history, including the miracles of manna, clothing and shoes that never wore out, and the debacle of the Golden Calf, the miracle there being that they were not all destroyed. There are consequences to the actions you choose. There’s an image in 10:16 which is sometimes translated as “incline your heart” or “cut away the barrier of your heart,” or, literally, “circumcise your heart.” The idea is to remove a metaphorical barrier that has desensitized you spiritually. Circumcision has been in the news recently: horrid outcomes for South African adolescents victimized by circumcision mills; and, more happily, speculation as to whether young Prince George of Cambridge – whose maternal forebears were apparently not Jewish, despite rumors – will be snipped and if so, will it be by a mohel. But a recent story in the Washington Post http://www.washingtonpost.com/national/health-science/a-rabbi-explains-why-hes-thankful-for-his-illness–sort-of/2013/07/15/5661a268-b67f-11e2-b94c-b684dda07add_story.html is built around “circumcising one’s heart.” Rabbi Charlie Buckholtz, aged 40, had an 8 mm tumor on a heart valve and had had 6 strokes in 2 months. He writes, “I started to see my surgery — the snipping of an obstruction so that my heart could be revealed and re-sensitized — as a covenant of rebirth. What began as a terrifying and inscrutable (but undoubtedly well-deserved!) punishment had become a vehicle for teaching me how intensely I wanted not only to live, but to live differently.” He has another stroke right before the scheduled surgery, and then the surgeon does an ultrasound and finds that the heart tumor is essentially gone; apparently, most of it had already broken off and caused the most recent stroke. “All that was left was a flat mass, smooth against the tissue of the valve, barely detectable and posing no danger to me.” A fitting and miraculous conclusion to a process in which both physical and emotional obstructions were removed. Thirdly there were the Irish who never knew what they wanted – but were willing to fight for it anyway. Lastly there were the English who considered themselves self-made men, – thus relieving the Almighty of a terrible responsibility. A wealthy Jewish man buys a fabulous home in Beverly Hills, California. He brings in a local designer to decorate the place. When the job is finished, the homeowner is delighted but realizes that he’s forgotten to put mezuzahs on the doors. He goes out and buys 50 mezuzahs and asks the decorator, who is non-Jewish, to place them on the right hand side of each door except bathrooms and kitchens. He’s really worried that the decorator will chip the paint work or won’t put them up correctly. However, when he comes back a few hours later, he sees that the job has been carried out to his entire satisfaction. He’s so pleased that he gives the decorator a bonus. 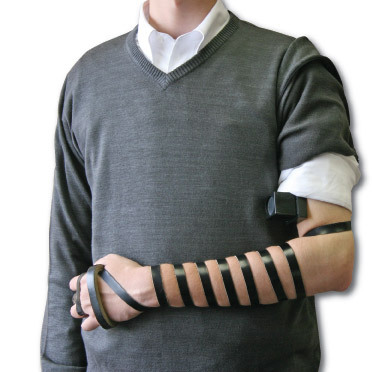 A Tefillin Sweater is a special charcoal-gray, V-neck sweater with zippers on both sleeves. Just unzip in order to put on tefillin without taking off the sweater. A Sweater with zippers? What’s the deal? The T-Sweater is a great way to stay warm during daily Shacharit davening. You’re already dressed so why struggle to remove a sweater when you can just unzip, stay warm and Daven better in Sweater! I REPEAT MYSELF WHEN I AM HUNGRY. I HAVE TO EXERCISE EARLY IN THE MORNING BEFORE MY BRAIN FIGURES OUT WHAT I AM DOING. A Jewish Texan buys a round of drinks for all in the bar and announces that his wife has just given birth to a baby boy weighing 20 pounds which even for a Texan is atypical. This entry was posted in Uncategorized and tagged circumcise the heart, Deuteronomy, Devarim, mezuzah, Moses, self-made man, tefillin. Bookmark the permalink.